I believe we can all agree that time is an asset that we do not have. One minute you are 19 and playing video games, hanging out with friends, the next minute you are 45 and driving kids to school. It’s true we do not have enough time on our hands, doesn’t mean we can’t utilize the little time we have. One of the best skills to have in this world is time management. Proper time management leads to increased productivity, increased productivity can lead to things like more money, time relax or just have fun. There are many tools that help you manage your time: we have Trello, Basecamp, Asana and many others. Today, we’ll be talking about Monday.com. Monday is neither “Trello clone” nor a spreadsheet. In a world where many tools have come up to solve the time management needs of creatives near and far, Monday stands out. As a part of the 43% remote workers, I’ve come to notice that Monday isn’t suitable for just teams. Even an independent contractor like me can take advantage of Monday to the fullest. In this article, we’ll see what makes Monday tick. Monday is used by over thirty-thousand companies for different reasons. They’ve collected many use cases over the years. 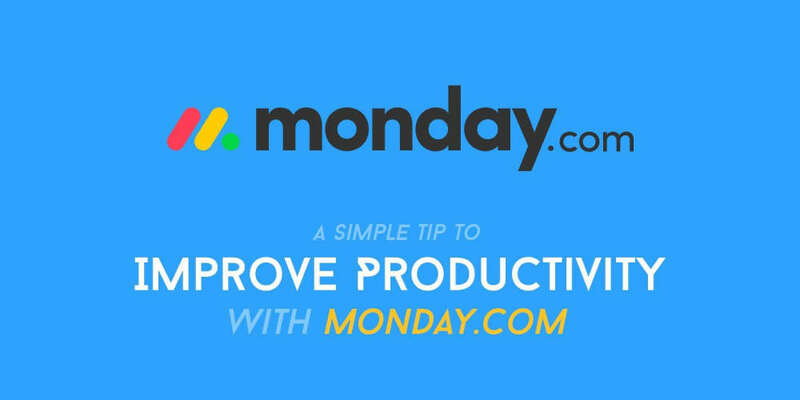 You can check out Monday.com stories for how some companies use it. Discovery channel: Creative Services team is a team of 14 individuals that use Monday to support Ad Sales to create various B2B marketing and sales material for a growing portfolio of 17+ networks. Wix: Used by their management team to manage engineering events and sponsorship. Lonely Planet: Used by their finance team — split across transactional, reporting and management tasks. Pulse: a task you need to work on (they were previously named Dapulse). Group: a group of pulses. Board: is a collection of groups. That’s all the grammar associated with Monday. Your first board After you sign up on Monday, you are greeted with this screen. The screen above directs you to create a board. A board is where you track what you are working on. After clicking New you will be provided with a couple options to create a board based on a template or Start from scratch. For the purpose of demonstration, we’ll start from scratch. After creating the board, get the above image. Let’s rename this group to a current project, let’s call it Scotch Redesign. From the image above, we can rename the group with the blue color as Current tasks and the group with the purple color as Completed tasks. This way, we can keep track of what’s complete and what we have to work on. We can also define tasks that we’d like to accomplish. I deleted the extra rows in the second group. I created a couple of tasks in the Current tasks group. Then I assigned them to me. Gave each of the tasks a status so Chris can get an overview of what’s going on. When I’m done, I can move them to the Completed tasks section for review. It shows a timeline of the tasks and how long a project might take. To see the project timeline on Monday, we need to first assign a timeline to each task. We can add a new column to our groups using the plus sign at the top of the group. When you click on the plus icon, you’d notice there are a few columns we can add. We are only interested in the timeline column. After adding the timeline column, it will be available across all of our pulses. We can then assign a timeline for each task. After adding a timeline, we can click any timeline and get an overview of the complete project timeline. You can also click on each pulse and have a conversation with your team members. This chat area can be used to share files with your team, set task lists and discuss features. At the time of writing this article, their lowest plan starts at $25/month. You can use their 14-day trial to find out if Monday is a good tool that adapts to your workflow. This article is a simple overview of using Monday to manage your day-to-day activities. Time is a very valuable commodity, if not the most valuable. It’s up to you to decide how you use it.